Hayagriva is an incarnation of Hindu God Vishnu with a horse head. The main purpose of this incarnation of Vishnu was to recover the Vedas, which were stolen by Asuras or Demons. In this incarnation, Vishnu is worshipped in a human body with a horse head. An important temple where the Hayagriva murti is worshipped is the Hayagriva Madhava Temple at Hajo in Assam. In Hindu scriptures there are two important legends relating to the incarnation of Hayagriva. 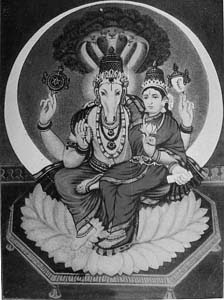 The origin of Hayagriva Avatar is dealt in the ‘Shantiparva’ of Mahabharata and the Puranas. In another legend, Vishnu appeared in the Hayagriva form to recover the Vedas. It is said that two demons named Madhu and Kaitabha stole the Vedas when Lord Brahma was sleeping. Brahma asked Vishnu’s help and he took the form of Hayagriva and brought back the Vedas. Since the Hayagriva incarnation is associated with Vedas, Vishnu in this form is worshipped as the Lord of knowledge and wisdom. Hayagriva is also the name of an important Buddhist deity.